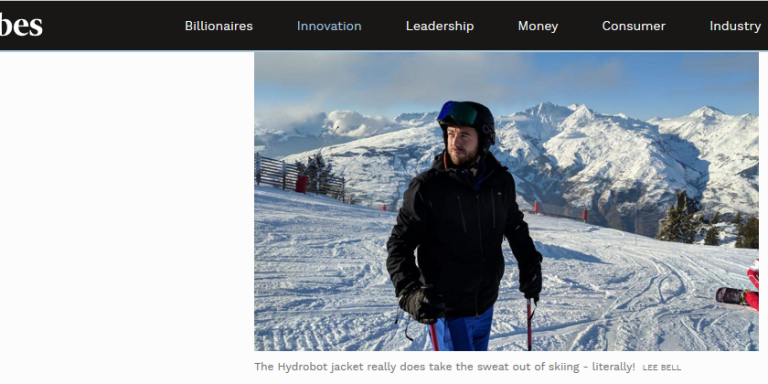 Forbes journalist, Lee Bell, has tested the Kjus 7SPHERE HYDRO_BOT jacket, which he describes as the most high-tech piece of clothing you might ever have laid your eyes on. “While skiing in the Alps, I used both the Hydro_Bot and a regular ski jacket at intervals to see if I could tell the difference, and I have to say I really could”, writes Bell. He explains how easy it is to use; simply download the app from the App Store or Google Play, click the button on the black electronics box, and connect. The technology comes as two panels, strategically located on the high-sweat zone of the back, allowing users like Lee Bell to feel fresher and less moist after a good few hours of skiing. Furthermore, we went to Salzburg to have a chat with two of the testers from the Austrian Ski Academy, who tested the Kjus 7SPHERE HYDRO_BOT jacket winter 2017/2018. The most noticeable difference for them was on a warmer day of skiing. Andreas Oberhauser was ski touring up a hill where he usually would be wet, but with the HYDRO_BOT technology he could ski down straight away without feeling discomfort, explained Oberhauser, Ski Instructor Austrian Ski Academy.